The holiday season in Nicaragua is always a busy time for us, not so much the Christmas portion but because it signals the end of the school year. Unlike the U.S. school year, which normally runs September-May the school year in Nicaragua is February-November. In 2012, the school year extended one week into December because classes were delayed one week in February. As with the end of any school year regardless of location, the final month is filled with parties, end-of-year activities, and relaxed discipline in the classrooms. It’s a fun time filled with anticipation of Christmas and a long vacation from school. 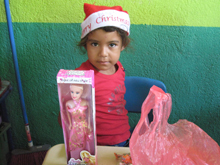 At Oasis de Esperanza, we traditionally have a combination Christmas/end-of-year party for all students, a special meal and distributing Christmas gifts. It’s earlier than most Christmas parties but once the school year ends it’s impossible to assemble the children for a party. It’s a fun time with each grade presenting a Christmas activity like songs, mini-dramas, dancing and Bible readings. This year the teachers joined in and serenaded the children (glad they don’t sing for a living!!). After the meal, Elaine and I are blessed to give each child a Christmas present along with candy and other goodies. For many it is the only gift they receive for Christmas. After the children are dismissed for the year, the remainder of the school time is spent in teacher evaluations vision retreat, teacher appreciation luncheon, and graduation for Pre-K to 1st grade and 6th grade to Junior High. It’s a special time for everyone and a time of acknowledge the hard work of the older students.